This is a time when some are starting families, buying a condo, and helping aging parents. Others are rising in their careers and some are job hunting. We are all at different stages of young adulthood but we are all alike. We are forging the path as young adults. This blog is not about social media and avocado on toast (although maybe a little). 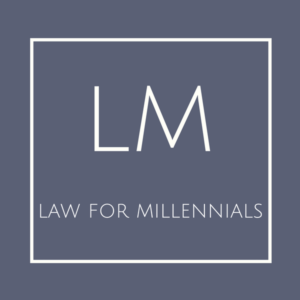 This blog is about empowering millennials with easy to understand information about the law and how it relates to our life's obstacles. Google "Millennial" and you'll see very negative words. The cover of Time Magazine reads "Millennials are lazy, entitled narcissists who still live with their parents... Why they'll save us all." The article says "Millennials could be a great force for positive change." This blog is for all of the Millennials. We are the misunderstood generation. We may live at home (why not!) but I do not know a single Millennial who is lazy, entitled or narcissistic (these are sweeping generalizations not rooted in fact). All of your favourite words are here: free, easy and about you (is that narcissistic or just honest?)! If you are in a legal dilemma, studying law, or simply interested in how the law in Ontario works, welcome! If you're born around 1980 to 2000 than you’re like me and one of the 80 million Millennials. Thank you for being a part of this and feel free to reach out if there is a legal topic you would like me to explore. Let us be that great force for positive change.